In our effort to create environments where humans and sea turtles can live together in balance, we have developed different projects. The first, a group of conservation and research programs both on the Caribbean and Southern Pacific coasts of Costa Rica. 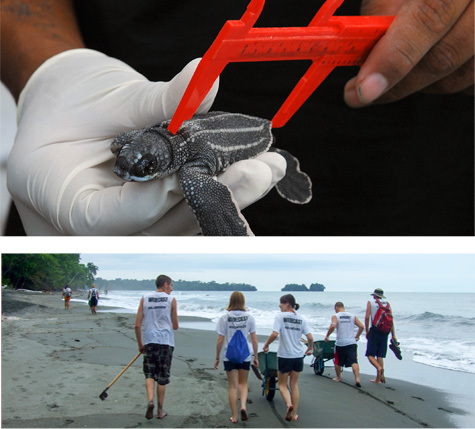 The Caribbean program is located in Cahuita, Moin and Pacuare beaches, where we focus on the nesting of leatherback, green and hawksbill turtles, while the South Pacific project is located in Osa Peninsular, where we work in the recovery of mangrove forests and sea grass beds as well as the studies of the rare Eastern Pacific hawksbill turtles. We have also generated a voluntourism project to create alternative livelihoods by training local partners on how to receive volunteers and tourism in community homestays. This increases strongly their local opportunities to have a better income and reduces the pressure over the turtles, their eggs and their critical habitats. Besides that, we initiated projects to monitor reefs, train the park rangers in monitoring turtle nesting and educate hundreds of local students on the importance of marine and coastal conservation. Finally we also advise the government on marine environments, participate in several local, national and international networks and publish articles to improve the knowledge about the ocean and its life.